It has been almost 4 weeks since the flood of 2013 hit and the clean up in Southern Alberta continues. The extent of the flooding is still unimaginable and level of devastation is staggering. Damages are estimated at more than $0.25 billion dollars. Although the water has receded and the Bow River was recently declared safe for swimming and boating, there are houses that still have basements full of muck and debris, bridges that continue to be washed away or were just recently opened, people who have not yet been able to return to their home and homes that will never be habitable again. The shallow lakes created by the flood waters are gone, and although I was here in Calgary during the floods, watching the rains fall, listening to the hour by hour accounts on the radio and seeing the rivers rising, I find it hard to wrap my head around the extent of the flooding. Especially now, when I see the clear, slow flowing rivers and the dry, albeit muck caked lands with uprooted trees surrounding them. There are obvious indications of the damages though the most lingering effect to me is the enormous sense of community that the floods have created here in Calgary and beyond. This community spirit of strength, pulling together and helping each other is something that I have not felt anywhere else. Maybe this is the Alberta Advantage that Calgarians are so fond of mentioning. Whatever it is, it feels good. There is a small town feel in a big city. As I drove up it was clear that this was a busy place. The parking lot was full of cars and transient looking people. There was a line up of cars dropping off donations. Inside, residents, staff and volunteers crowded the large foyer. I was shown where to put my donations and when I offered to help, was immediately recruited along with 10 or more other volunteers, to move piles of clothing and bedding donations from one of the front rooms to the second floor so that the room could be used as a sleeping space for residents.My first volunteering stint was on the Friday of the floods June 21. 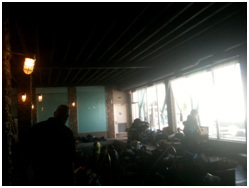 I had heard on the CBC radio that in the wee hours of the morning on the Friday the basement of one of the downtown homeless shelters had started flooding and the residents had been evacuated to an abandoned hotel in the North East end of the city, not too far from where I live. When the sun finally came out late that evening I felt the need to do something so I drove to the grocery store, bought some staples and headed over to the temporary hotel location. Once those donations were cleared out, we were re-located to the kitchen, with at least another 20 volunteers to form a ‘conga-line’ and move fruit and vegetable donations out to a waiting ‘refer’/refrigerated truck and then sort dry good donations into piles in rooms near the kitchen. We were told that they were going to be there for about 5 days. The mountains of food donations made my few bags of groceries seem insignificant and looked like they could feed a small army for a month. I was truly amazed by people’s generosity. Two and a half hours after I arrived it was time to leave. I was invited to come back the next day if I could. The next morning I headed back to the temporary Drop-In Centre. I did not arrive in time to help serve breakfast, which starts at 7am, but I was in time to sort clothing and toiletry donations, of which again, there were many. There were bags upon bags of shampoos, conditioners, toothbrushes, toothpastes, soaps, hand lotions, shaving cream, razors, deodorants to be sorted into baskets, as well as socks, underwear, shirts, pants, dresses, coats and shoes. There was a small consignment store worth of donations needing to be sorted and later to be distributed to residents. Although the numbers started small, by mid-day there must have been over 30 volunteers so we really began to put a dent in organizing the donations. I left mid-afternoon, shortly after we closed ‘the store’ where residents came for a one-hour window to request clothing and personal care items. I did 4 volunteer stints at the Drop-In Centre while the floodwaters were high and the Mayor was asking all no-essential personal to stay away from downtown. Rolling socks and sorting toiletries was not quite as immediate as building burms to keep the river from flowing over its’ banks or rescuing trapped residents, but it felt like a needed way to contribute. 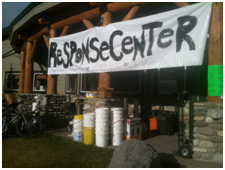 The next opportunity to be of service was in Bragg Creek, one of the communities that was quite hard hit by the floods. It was the next Saturday. I went with a friend from work and we were meeting two friends of hers there. 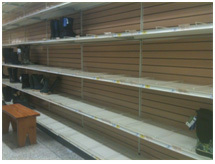 We spent the morning searching for water boots, work gloves, N95 masks and, mostly to no avail as there simply were no masks and water boots to be found in any of the Calgary hardware stores we visited. Luckily when we got to the Evacuation Centre in Bragg Creek there were other tasks that needed our attention besides cleaning muck out of soggy basements. I had never been to Bragg Creek before so I did not know what it had looked like before but even as we drove into town and took the cut off toward the Evacuation Centre there was a slight ghost-town sort of eerieness as we passed by a rustic strip mall where it was clear that none of the stores were open because they had been damaged by the floods. There were pools of water everywhere. We had brought donations of groceries for the evacuees and the volunteers so we were directed to the community kitchen to drop off the donations and that is where we ended up volunteering, cutting cucumbers and tomatoes, making salads, washing, sterilizing and stacking dishes in the busy community kitchen that fed the many evacuees who were still living at the evacuation centre, the hoards of volunteers, like ourselves, where were showing up carload after carload to be directed to wherever there were clean up tasks to be done, and the hundreds of people where were coming for the flood benefit later that evening. We were there all afternoon and were on our feet the entire time. Only finally sitting down to eat some of the food we had been preparing when, one of the evacuees who was also one the main kitchen organizers, insisted that we stop to eat. 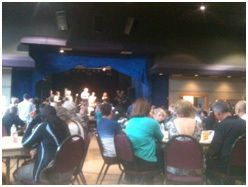 Sitting at a table in the main hall we were joined by a nurse who had driven from Cochrane to attend the flood benefit and her friend who was studying genetics. Across from us was a large table where the owner of one of the local restaurants that had been flooded was sitting with his family. There were kids running around everywhere, as well as police, firefighters and all ages of everyday citizens. Worn out from chopping veggies, we left before the show began. The next day I drove out to the Oku Damashi Dojo to meet Sensei Tammy Thankachen and drive with her out to the Siksika Nation to deliver the donations that her dojo had collected for those affected by the flood. We arrived at the local High School where we had been told the food donations were being accepted. The gym of the High School had been turned into a receiving centre for food donations and there were bag after bag and box after box of dried, bottled, packaged and canned foods alongside a small mountain of packages of bottled water. We added the donations we had brought to the stacks and went to the volunteer registration centre to sign up to help sorting donations. 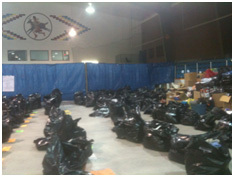 We were told that where we were really needed was in the Sportsplex where volunteers were sorting clothing donations. We needed to go over there anyway as I had also brought some tents and camping supplies as these had been listed as in great demand.